West Plains, Mo. 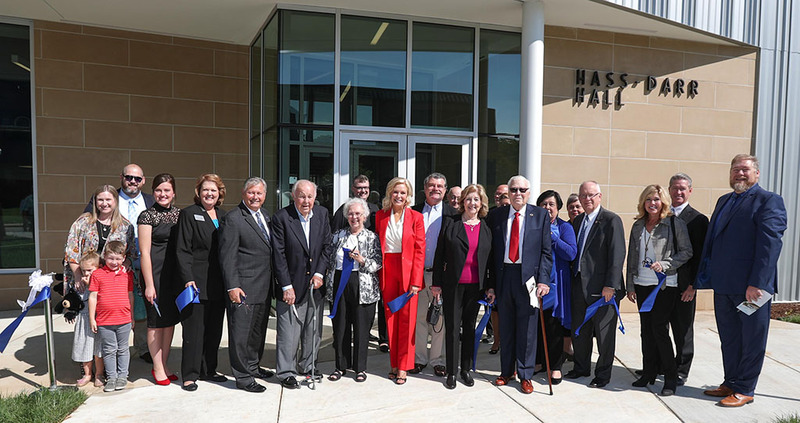 – With the snip of 11 pairs of scissors, members of the Judge William R. Hass family, William and Virginia Darr, and representatives from Missouri State University officially opened Hass-Darr Hall Wednesday, Sept. 26, at Missouri State University-West Plains. An estimated 250 students, faculty, staff, government representatives and area residents attended the dedication and ribbon cutting ceremony, seeing for the first time the latest addition to the campus. The 18,000-square-foot facility, which once served as the West Plains Post Office, will become the “heart of the campus” with the variety of services it houses, Missouri State-West Plains Chancellor Shirley Lawler said. These include the Darr Honors Program, Carol Silvey Student Union, Drago College Store, Admissions Welcome Center, Veterans Center, student life and development office, tutoring services and other much needed classroom and administrative space. The facility is named Hass-Darr Hall in recognition of significant gifts from two families who are long-time university supporters, Mary Hass Sheid, the William R. Hass family and William and Virginia Darr.